Dr. Sue and I (Marci) want to share with you a quick tip about intuition. Intuition is when we gain insight without the use of reason. Intuition is knowledge that comes to us spontaneously before we have a chance to analyze it with our intellects. Unfortunately, over time we start to doubt our intuitive voice, and we start to shut down that channel of information. The good news is that it’s still there waiting very patiently for us to open up. It’s ready to get back into business again, but it’s like a muscle that hasn’t been exercised. It’s still there, it still exists; and if you want to build it up, you need to exercise it consciously. The first and most important thing that you can do to develop your intuition is to acknowledge and honor the messages that you receive. Start noticing simple gut feelings throughout the day, trust those gut feelings, and act on them. Even if they seem illogical, you’ll be amazed at the positive results that show up. Although the mind is sometimes a useful provider of knowledge, it often throws us off course as our intuition bumps up against the mind storehouse of old imprints and old fears. Now, you may be thinking to yourself, “I don’t really have intuition. I don’t get those gut feelings.” If this is the case, then you may be looking for the wrong thing. Intuition may not be a BIG BOOMING voice that shouts “Here I am! This is what you’re supposed to do!” It’s more often a subtle impulse. It sometimes tends to come back again and again until it gets our attention. So, here’s what we recommend. First, slow down, s-l-o-o-o-w down. Intuitive knowledge can’t come to an agitated mind. When you’re running around like a chicken with its head cut off, STOP, take a few breaths, and just ask for an intuitive answer. When we’re moving so fast, we are spinning. 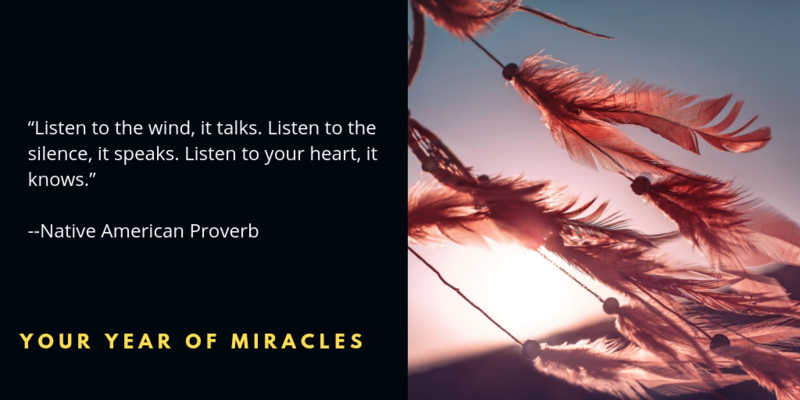 Instead, stop, take a breath, and ask your higher self, “What do you want me to know right now?” Nine times out of ten, we get a profound answer because the contrast between the spinning and the silence allows a portal to open and your intuition to speak. Your intuition is a muscle that needs to be exercised or it can degenerate. And, then it takes longer to get it back up and running. As they say, “Use it or lose it!” We send you much love and wish you many miraculous intuitive experiences as you slow down, breathe, and become attuned with your higher self. I love the tip about slowing down! Seems like I am always rushing through my day from one thing to the next and going through a to do list in my head. It’s hard to hear myself think, let alone hear my intuition. Thank you for this reminder. Native Americans were the most beautiful and insightful people … The Great Spirit? How cool can it get? All good thoughts and ideas for laying a foundation of intuitive awareness. I have been working with my intuition and with the subjective awareness of others in personal and business life actively, for the last 30 years. It is absolutely a vital piece in our overall awareness and effectiveness in living our lives. I like the idea of listening and responding to my intuition. Indeed I must say I get this intuition on many occasions. My dilemma though is how to make a distinction between my true intuition and the games my old imprints play against me. isn’t it possible that the imprints can influence my intuition? Intuition is the voice that knocks at the door with a message. It must be listened to actively. When it is noble it must be implemented. The amazing miracles will happen. Gratitude must be expressed when it knocks. The door must be opened for a miracle to arise. My intuition is that still small voice that I can always trust, if only I would listen to it more I would be more content.